So, we talked about the galaxy fold it’s a 7.3 inch tablet that falls in words to become a 4.6 inch small handy phone Samsung’s vision with a foldable phones right now, is to create a perfect tablet and small handy phone hybrid foldable device. However, Huawei’s approach is different. So, instead of a 7.3 inch tablet display, it has an 8 inch tablet display that falls out words. The output folding is what give this device an edge over the Galaxy fold, because, with the help of outward folding, it gives you do more displays on each side. So, on one side; you get a 6.6 inch display, which is nearly bezel. And on the other side, you get 6.3 inch display with triple cameras on the back, which because of the fold, can be used for taking selfies as well. The Huawei Mate X features 3 cameras that are similar to the Huawei mate 20 pro families, a telephoto lens ultra-wide-angle all that goodness. And thanks of its outward folding, there is no need for the front camera. And that will open the doors to a possibility of a complete elimination of the front cameras, which it doesn’t have space on full edged phones. The mate X is also the slimmest foldable phone in the world coming at 5.4 millimeter thickness no gab at all and even in folded state it’s about 11 millimeter thinner than the Galaxy fold. And because of the three foldable displays, the mate X allows you to see your picture in real time, while someone else is capturing you which is absolutely incredible. And thanks to its fast charging technology that sets at 55Watts, and the super 5G connection which is first than ever. It is absolutely insane more than any other phone out there as like the Samsung approached Huawei definitely wins it with their outward falling. The game is completely changed you get displays on each side, in total you have three OLED displays to play with. 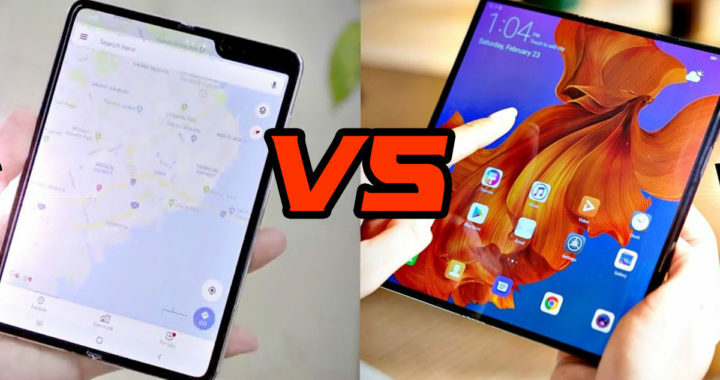 The only thing that is better with the galaxy Fold, is obviously its science because it can get really small but still it is definitely not as thin compared to the Huawei mate X.
Huawei new foldable flagship, cannot take selfies when it’s on the tablet mode. Because, there is no front camera on it. And it does make sense because, taking a selfie in the tablet form could be extremely hard for most people. Because, it forces you to hold the phone with one hand and obviously you’ll be stretching out your hand from your face, and there’s a good chance you will drop your phone. While in the Galaxy fold since the fold is inward, they had to include camera everywhere. So, there’s a dual camera in the tablet mode, which when folded gets hidden that’s why they had to add another camera in the 4.6 inch phone. The good thing about the galaxy Fold is that even if it’s not folded, you will still be able to take selfies and with applications like Instagram, where you use a front camera and sometimes you switch back and forth at the same time or recording a story. So, that is something possible with the galaxy fold, but because, of just one single camera setup on the Mate X, that actually might not be possible. But again, that’s not a huge deal for most people. Generally, and honesty I think Huawei wins the foldable game, because, of their inward fold. Another aspect of this is the software, which looks pretty good on both phones Samsung has demonstrated a software approach like you can use three applications on one display at the same time to perform true multitasking. Hopefully the Mate X also comes with these type of software tricks. And we’ll see how these devices perform when they come out to the users. Now Samsung will still be able to dominate because of its OLED productions. As these is only the first version product from both brands, we’re definitely going to see more improvement sooner. There will be about a 1M of Galaxy fold units this year. Whereas, the Mate X will only get about 200,000 units, because the supplier is BOE companies. So, I guess Samsung will in the end sell more of its mobile phone worldwide. The Mate X will cost you $2,600, which is definitely a lot expensive. And is $600 more expensive compared to the Galaxy fold which is coming at near $2,000. Just because, these are first generation products, with more foldable phones coming out, you’ll definitely see these pricing to go down. Tagged foldable huawei phone, huawei foldable phone price, huawei mate 20 x release datehuawei mate x foldable, huawei mate x foldable smartphone, huawei mate x phone, huawei mate x vs galaxy fold.